SmuttyCat loves superhero movies done well. 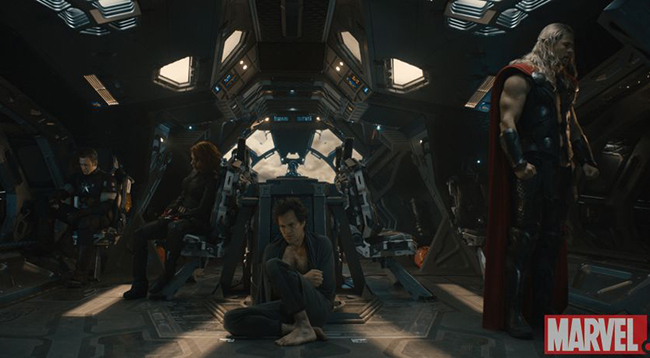 Avengers Age of Ultron goes above and beyond with action, angst and armor. The movie opens with the team in action cleaning up Hydra elements. Later, as the team kicks back to relax personalities start to shape up. Black Widow is cool and ruthless. Banner almost comes to terms with the Hulk and Tony Stark uses brilliance and insanity in equal portions. While story concerns may give some more screen time, this is a true ensemble project. All of the heroes are great and all are flawed. Captain America seems to be the one most at peace with what and who he has become. Yet the run away center of this magical entertainment is James Spader as Ultron. The delicate truth of Stark’s alter ego run amok is portrayed with sly ease by Spader. Being a Blacklist fan, SmuttyCat enjoyed watching Ultron and creator match wits. If AOU has any weakness, it is not having enough time to delve deeply into the elite chess match between these two. Oh, and the brother-sister accents are awful. Hulk-buster armor with flying backup! SmuttyCat wants one. Stark tech continues to rock extra hard. While the multiple robots Ultron uses mimics Iron Man 3, Tony continues to upgrade. Awesome fight of all time award to Iron Man vs Hulk. Major fist bump heard around the world. Grand Diva entrance award to Ultron who reminds the Avengers they don’t get to be normal. Best line of dialog toss up; “you get hurt, hurt back. You die, walk it off”. And “go to sleep, go to sleep, go to sleep” lullaby sung while pile driving the Hulk’s face. The grade? Script – A for great continuity of series, if not true to print story. Acting – A+ for all around good performances from all. The weary but determined heroes back in the muck again. Effects – A+ for lack of cheesiness. Pacing – A- for simply too much action to cover in too little time. Marvel has created a masterful formula for action/hero movies that will be hard to top for the foreseeable future. And that’s just fine with SmuttyCat. 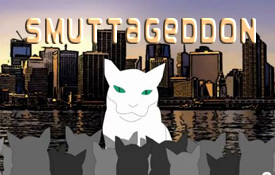 Don’t take SmuttyCat’s word, check the trailer for yourself, then run to the nearest theater. Robert Downey Jr., as Iron Man, Chris Evans as Captain America, Chris Hemsworth as Thor, Mark Ruffalo as The Hulk, Scarlett Johansson as Black Widow, Jeremy Renner as Hawkeye, and Samuel L. Jackson as Nick Fury, Don Cheadle as James Rhodes/War Machine, Cobie Smulders as Agent Maria Hill and Stellan Skarsgård as Erik Selvig, James Spader as Ultron, Elizabeth Olsen as Wanda Maximoff, Aaron Taylor-Johnson as Pietro Maximoff, and Jarvis gets an upgrade when Paul Bettany becomes Vision.